Ulla and Pekka Eskelinen had noticed a requirement for a new cafe and the opportunity arose when the new shopping center Kastelli was built. Pekka Eskelinen was involved in all the planning, as early on from the initial building stage. 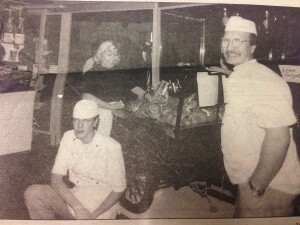 He has been active in the cafe and bakery industry since 1974. In the beginning, HerkkuPekka was a small cafe with 20 seats and couple of glass units displaying some cakes and pastries. In 1995 the shop unit next to the cafe became available and the much awaited and needed extension was possible. This made it possible to expand the product categories to include savoury pastries and breads. It was also possible to offer more choices of cakes. In 2013 Ulla’s and Pekka’s oldest son Teemu, who had been there from the beginning, took hold of the reins of HerkkuPekka. Today the cafe has seating for more than 100 customers and the selection of produce is vast. There are over 50 metres of shelf space, packed full of differents options for lunch or for sweet treats.